The spring colors are on the way! Trees are showing signs of life with buds getting green, birds are returning from vacations in the Southern Hemisphere, and the peepers are keeping us up at night with their mating calls from any little wet area near our houses. These are all clear signs of spring. Many of us spend the better part of February and March repeating a mantra of “spring is just around the corner.” When we gather with our friends, neighbors, loved ones and fellow employees the conversation often turns to signs of spring. There is one sign of spring that many of us don’t even know about even though we drive past it, or over it, every day. Every spring, as the cycles of light change, and the water begins to flow a little more regularly; the streams of the Ozarks begin to color up. The color comes in the forms of red, blue, and green scales on small, unknown fishes. Not unlike the migration of the birds back to our forests, the fish regain their color for spring breeding on their own time schedule. Some of them like to breed early, when only the most die-hard fish-head would consider going into a stream to look for them. Some, not unlike most of us, enjoy the warmth of a late spring day to strut our stuff. With the exception of a few of the dry or hot months of the late summer or fall, there is almost always a fish in breeding colors in Missouri. Here in the deepest of Southwest Missouri we have several species of darter, a bottom dwelling, small fish that loves to dress to impress in the early spring. The male orange throat darter sports a beautiful combination of red and blue in his fins. These guys can be so colorful that is possible to see their colors from the shore. If you want to see one though you will have to look in the cool spring fed waters that they prefer. Greenside and banded darters both sport a coat of emerald green when they are trying to attract the attention of the ladies. You will find both of these in bigger streams like Shoal Creek, and around vegetation where their brilliant green isn’t quite so obvious. Stippled darters are a less common, but beautiful species of our small creeks. Like the orang throat darters they prefer the small springs and cool waters. They spend much of their time around vegetation. When they are trying to attract a mate they sport a bright orange belly, while the rest of the body turns very dark. They are quite the little gem to pull out of a mass of submerged weeds. These are just a few of the colorful darters of Southwest Missouri. Spring is on the way. The darters know it, the robins know it and judging by the number of times I have glanced out the window longingly as I write this, I know it too. Brave the cold and rain a bit and get outside and welcome it. If bravery is calling your name, maybe you will even put on a pair of rubber boots and go look for some hidden signs of spring in your local streams. However you want to greet spring, please take the time to leave it a little better than you found it. Kevin Mouser is a member of the Chert Glades Master Naturalist Chapter. He is the Special Education Science teacher, Ecology teacher and Science Club sponsor at East Newton High School. When he is not teaching, driving a school bus or sleeping, he really enjoys spending time with his wonderful wife Cristal and getting into the great waters of the Missouri Ozarks. Posted on March 24, 2015 by Shawn Kirkbride and filed under ASK A NATURALIST, EDUCATION and tagged SPRING BIODIVERSITY ECOSYSTEM ENVIRONMENT FAMILY FISH LOCATION MISSOURI NATURE SCIENCE SPRINGSTREAMS WADDING. The event has been described in naturalists’ circles as the “Sky Dance”. The fans of the book The Sand County Almanac are very familiar with it. I have enjoyed the avian flight dance for decades and now look forward to the weeks of performance running most every late winter day on my own property. The stage is set along my resident nature trail and long driveway snaking through native grass lots, young forest and shrubby fields. The “stage curtain” rises as the sun retires and I find myself on edge waiting for the first player to come out. I have known colleagues who have rushed home from work to catch a television show or sports event, clearly I understand their anticipation. Now every February and March I’m going home, work can wait, the sky dance is premiering. The contestants are the American Woodcocks and often we Ozarkers know them as “Timberdoodles”. They are related to the graceful shorebirds of this country’s beaches and mudflats. Perhaps the timberdoodle is the awkward shorebird cousin, for when I mention to beginning birders the woodcock is “gnome-like”, I get nods and smiles from the baffled birdwatchers. Twilight brings the performance of the males and it is both visual and auditory. The nasal “peent” call is the icebreaker. The call is given from the males at ground level. The first famous flight display of the evening is a wide circular flight against a backdrop of sunset pastels. The timberdoodles go higher and higher; the whole time the wings quiver and make a twittering sound. The most engaging part of the night show is there are sky circles taking place everywhere! Perhaps at the peak of height, around 300 ft. the twittering jingle stops and a flight song accompanies a zig zag flight to the ground. If the gnome remark created a sparkle in the eyes of a beginning birder, you should see the expression when I mention the song resembles the sound of kisses on my face from my great aunts in my youth. If you have that sort of extended family in your childhood, I guarantee you will recognize the sound. The cycle of peenting, display flights and songs continue well into the darkness and sometimes have a short encore at the break of dawn. It is the type of show in natural history that entwines the fabric of our personality to the outdoors. We who appreciate nature seek these adventures and want to share them. We recognize the naturalist bond in every thread of our experience. I could not agree more with my champion Aldo Leopold who wrote about the drama of the sky dance and my mentor Dr. Janice S. Greene (MSU Biology Dept.) who first introduced me to his writings and observations. I encourage everyone to grab a youth, friend, or even an aunt and seek out the timberdoodle’s gift to our outdoor experience. Jeff Cantrell is a local biologist and educator in SW Missouri, adjunct professor at MSU and proud member of the Aldo Leopold Foundation. Jeff can be reached at coyoteteacher2@gmail.com. 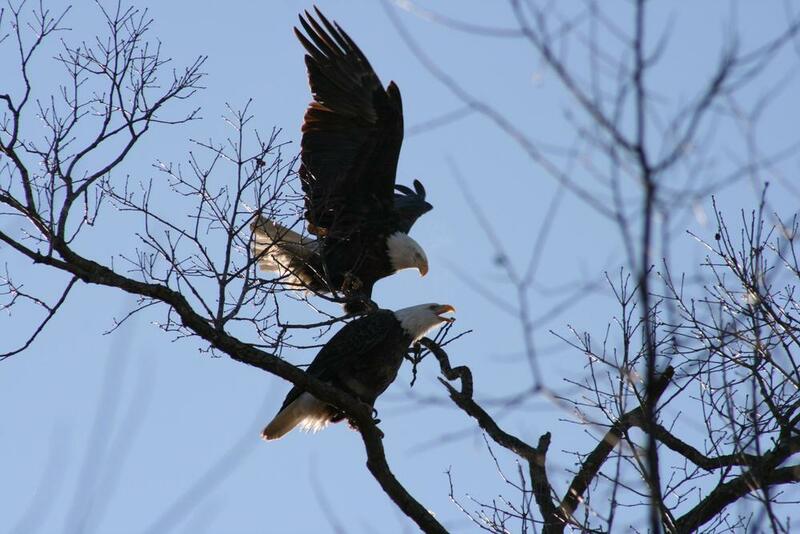 Posted on March 11, 2015 by Shawn Kirkbride and filed under ASK A NATURALIST, EDUCATION, EVENTS, MEMBER NEWS, NATURAL HAPPENINGS and tagged AUDUBON BIRD BIRD BEHAVIOR EDUCATION ENVIRONMENT LOCATION MISSOURI NATURE SPRING TIMBERDOODLE WOODCOCK. I love trees. Call me a “tree hugger” and I’ll take it as a compliment. It’s a label I wear proudly. So, tree watching is a pastime that occupies my time as I walk, drive, or just sit in the backyard. What might be surprising to many people is that one of my favorite times of year to “watch” trees is winter. I know, you’re thinking “What?!! !” When most people think of trees in winter, they think of drab, gray, and unpleasing. When asked which season has the most beautiful trees, most people would probably respond that autumn trees are their favorite. It’s hard not to love trees in autumn. Their colors are beautiful and warm and are the subject of artwork and photography. I love trees in autumn. In springtime, seeing the buds emerge on trees and the freshness of the newly formed leaves is always exciting. We all love the beautiful greens of spring trees and the blossoms on dogwoods, redbuds, and other flowering trees that come with the warming temperatures of spring. I love trees in spring. In summer, we are thankful for the shade of trees that provides us relief from the heat and reprieve from the blazing sun. The coolness of a tree lined hiking path or a shady backyard are wonderful gifts in summertime. I love trees in summer. But, what, you ask, do winter trees have to offer? Winter trees allow you to see their potential. For me, one of the things I enjoy most when driving is looking at trees. You can see their trunks and limbs. It’s interesting to see the forms they have. I sometimes look at them and think of how they are like people. Some are long and slender. You can imagine them modeling hiking clothes. They look like they must always be on the go, never sitting around being lazy. Some are full and squatty and seem to be vertically challenged. They offer great protection for our friends, the birds. When you look more closely, you can often find nests that are not visible in the other seasons. Some trees appear to be perfect, just like some people. They spread their limbs both vertically and horizontally and seem to have everything you could want for a tree in your yard. Their strong limbs look ready for the treehouse or the swing and their perfect shape makes you visualize them in the front yard of any home. Some trees seem to have had a tough life, but aren’t quite ready to give it up. Some of their limbs may be gone, some are barely hanging on. Other trees seem to have let themselves go and their branches kind of stick out randomly. They show the effects of age with sagging and straggling limbs. They make me smile as I enter that stage of life. Trees in winter allow us to better enjoy the beauty of a sunrise or sunset. Seeing the colors of the sky through leafless branches enhances our enjoyment of the experience. There are few things more beautiful than a winter sunset glowing through a group of trees. I love trees in winter because they reveal hidden treasures. Have you ever passed by a place in winter and all of a sudden you notice an old barn, homestead, tree stand, or some other mystery that you’ve never before noticed? It’s pretty exciting to find something that’s been hidden by the leaves of trees and is now revealed. 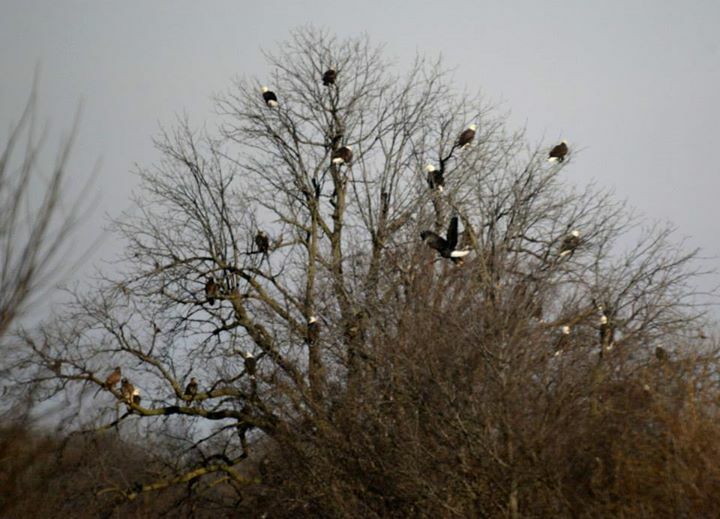 Posted on February 16, 2015 by Shawn Kirkbride and filed under ASK A NATURALIST, NATURAL HAPPENINGS and tagged AUTUMN ECOSYSTEM ENVIRONMENT LOCATION MISSOURI NATURE SPRING TREES WINTER. I was ten and participated on my first guided hike and it just so happened to be in amazing Yellowstone. My folks are national park enthusiasts and my mom’s mission this trip was to grant her young conservationist the gift of a rare wildlife experience. When we think of wildlife, endangered species stories frequently emerge and they have a gloom and doom undertone to them. Biologists strategize on how to reverse the decline of the population while the nature-loving communities offer support any way they can contribute. So unfortunately when the subject regarding threatened species comes up we are prepared for a grim outcome. The trumpeter swan is the largest of North American waterfowl and surely one of the most stunning. The trumpeters to me simply symbolize all that is graceful and stylish in nature. A swimming swan resembles an ice skater’s refined glide and their reflection appears to pursue the bird on a blue or silver mirror. 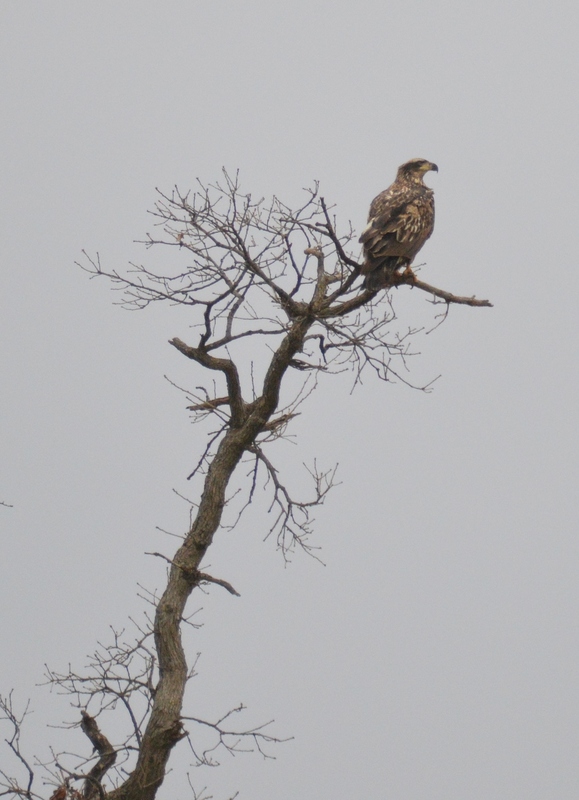 The adults are a crisp bright white, while the juvenile’s plumage matches the winter sky. They are a true conservation success story recovering from brutal market hunting for their skin, feathers and meat. Quill feathered pens were a favorite instrument of John James Audubon to tailor the groundwork sketches for his celebrated bird paintings. The swan feathers inflated pillows and mattresses for the aristocrats and colonists to rest well and dream of the promises of a fresh America. The trumpeter swan contributed a great deal to our pioneer heritage and we find their presence carved on furniture, printed on currency notes, in Native American culture, and much more. They emerge from a population less than 70 trumpeters in all of Canada and the lower 48. They rode the conservation/preservation wave of early conservation laws and the collapse of plume hunters and feather fashions. Heroes like Teddy Roosevelt, George Melendez Wright and William Hornaday were in their corner. Today, our area benefits from captive conservation breeding flocks of Iowa, Minnesota and Wisconsin. It is fortunate the birds don’t recognize state borders and so we benefit from trumpeter swans vacationing here during the winter. After being completely absent, I have now witnessed them steadily increase in our area every single winter these past 20 years. Their occurrence restores their place in our culture and history; they certainly glide across our view with a wonderful sense of style. The story of the trumpeter swan is a real conservation story. I love happy endings especially when they have a touch of class. Posted on February 7, 2015 by Shawn Kirkbride and filed under ASK A NATURALIST, EDUCATION, NATURAL HAPPENINGS and tagged AUDUBON BIRD ENVIRONMENT MASTER NATURALIST MISSOURI NATURE TRUMPETER SWANS. 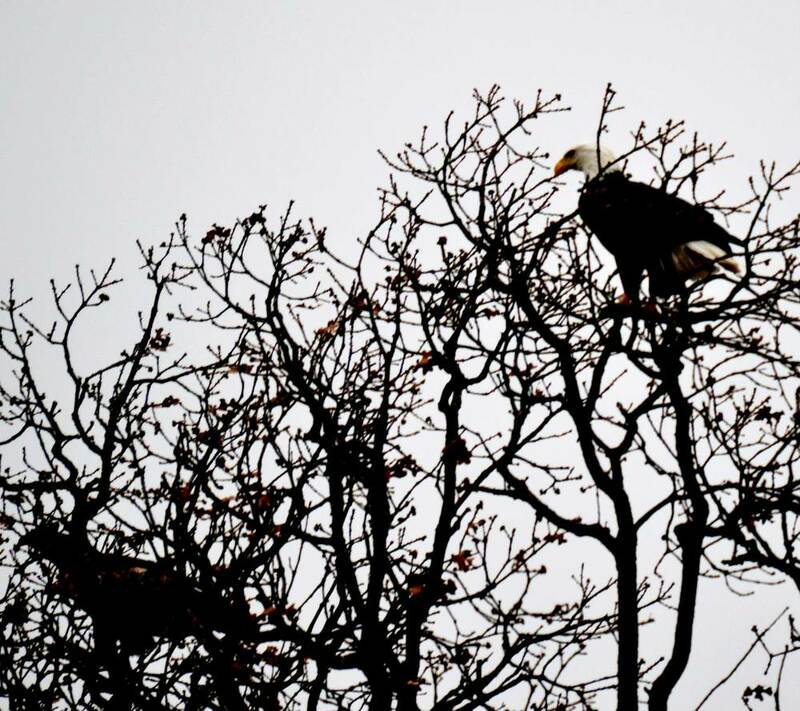 It’s that time of year again — time to view the eagles at Stella. 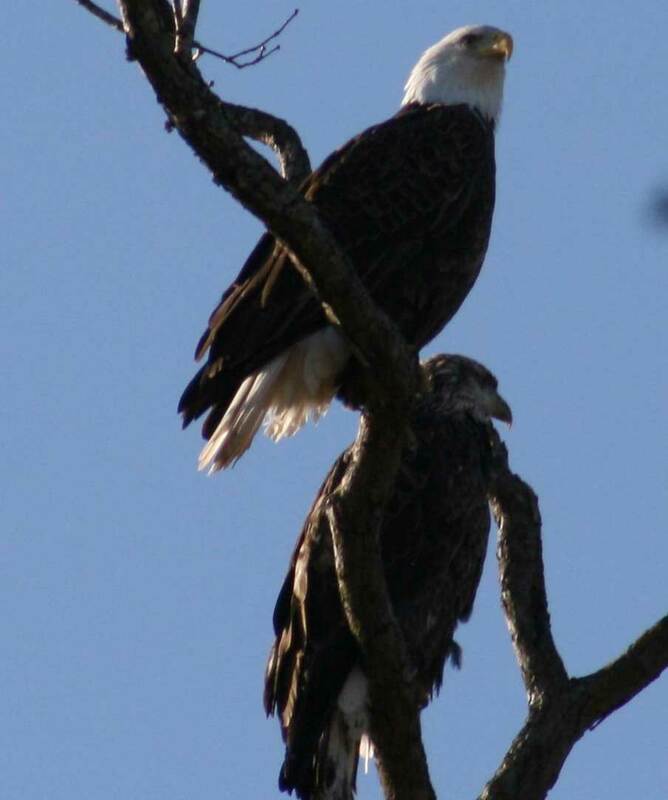 The Chert Glades Master Naturalists will be hosting the Festival of Eagles on Saturday, January 24, 2015 at Stella, Missouri. Activities begin at 10:00 a.m. and go until 3:00 p.m. 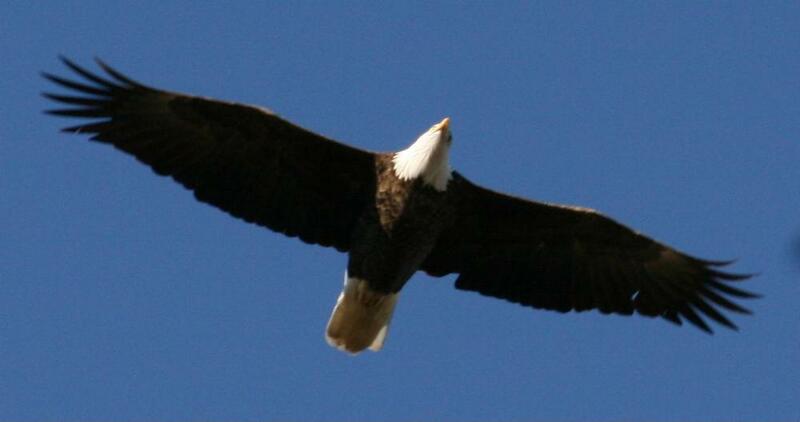 There will be scopes set up for getting up close and personal views of the eagles who visit Stella every year. Representatives from the Missouri Department of Conservation and Missouri Master Naturalists will be available for answering questions. There will be a life-sized eagle nest replica, a life-sized eagle wingspread to compare your “wing span” to that of an eagle, face painting, and more. Volunteers will be scouting the area for good viewing opportunities and maps will be available to help you get the best views. Every year the town of Stella has some goodies available for those who visit. There will be hot coffee, hot cocoa, and baked goodies available at the Methodist Church. For directions to Stella, you can check mapquest or google maps. Here are simplified directions: from Joplin, take I 49 south to Neosho, exit 24 (US 60). Turn left. Go 1.3 miles. Turn righ on I 49 BUS/MO 59/US 71 BUS S. Go 1.3 miles. Turn left on Lyon Dr. Go 1.5 miles. Turn right on Doniphan, go .8 miles. The road will curve left and become Hwy. D. Go 10.6 miles. Turn left onto Hwy. A. Go .8 miles and you will be in Stella. The activities will be located at the city park on the corner of Carter & Ozark streets. So, come join us for a day of fun in the great outdoors. Dress for the weather, bring your camera and binoculars, if you have them, but mostly just come to enjoy the day. It’s a great opportunity to spend time with your family, learning about one of the great successes of conservation. 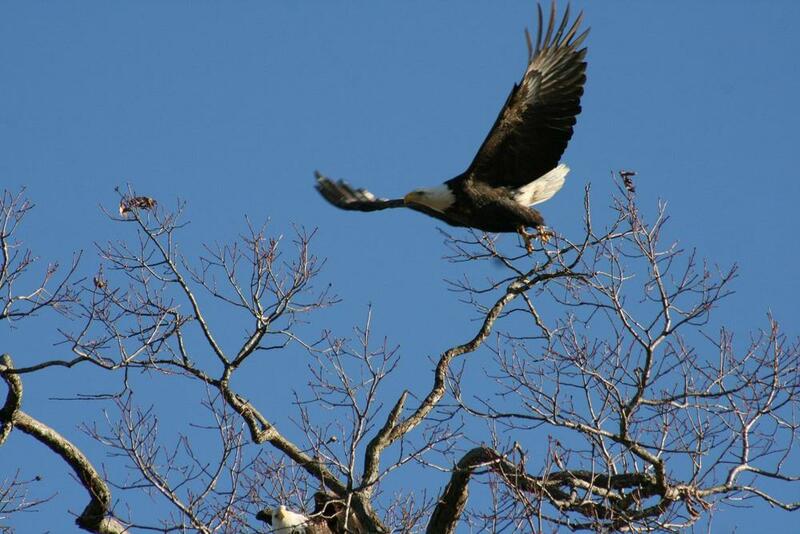 In winter, Missouri is a leading migratory stop for Bald Eagles, and Stella is a great place to see them! 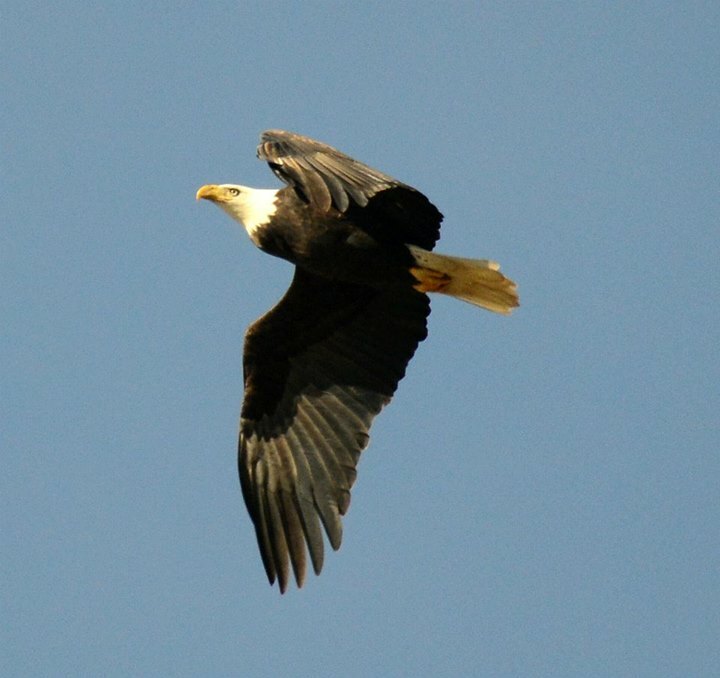 Bald Eagle recovery is a spectacular conservation success story! 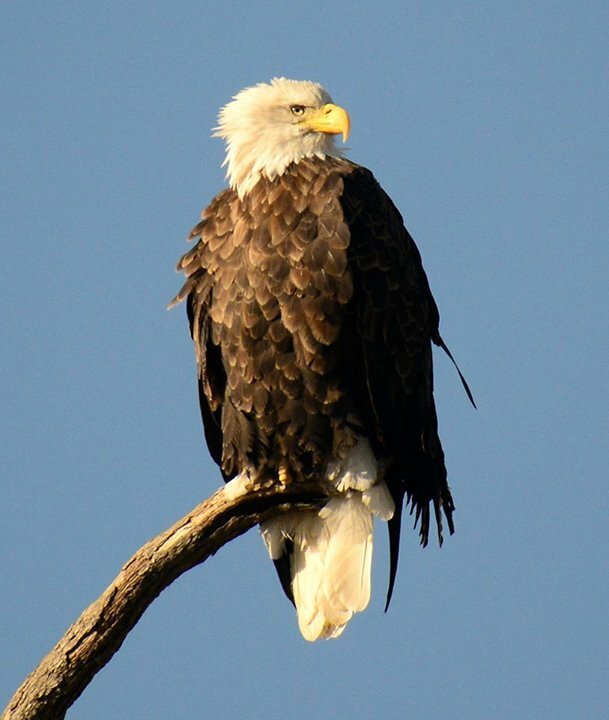 2007-present – More than 2000 Bald Eagles winter in Missouri with 200-300 nesting pairs! 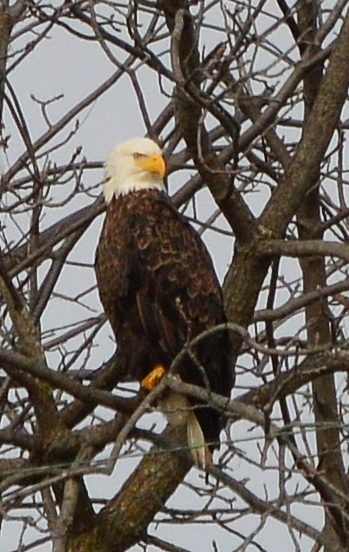 Posted on January 20, 2015 by Shawn Kirkbride and filed under ASK A NATURALIST, EDUCATION, EVENTS, NATURAL HAPPENINGS and tagged AUDUBON BIRD BIRD BEHAVIOR EAGLE EDUCATION ENVIRONMENT FAMILY MASTER NATURALIST MISSOURI NATURE.